Not many people embrace the accordion, and then abandon their day job. It’s just not done. But, Jason Webley did just that. Maybe it was a reaction, at that time,to his belief that his life was falling apart. Maybe it was a response to a yearning for another place, and another kind of life. Or maybe he just wanted to have fun. But, for whatever reason, Jason took the accordion, and created a radically different life beyond his hometown of Everett, Washington. In the early 1990’s, while in High School, as musically adventurous people often do, Jason formed a punk band, Moral Minority. Even then, he was a skilled multi-instrumentalist proficient on guitar and other instruments. “We did all of three gigs in our local community…I was in a band with some roommates in college that did two or three gigs. Then, I was in another band that wasn’t exactly a punk band..and we did a ton of gigs and nobody ever noticed us.” In 1996, during his senior year at the University of Washington, while working on the music for a play, The Caucasian Chalk Circle by Bertolt Brecht, he found an accordion that his parents had purchased at a garage sale, and used it in his performance. 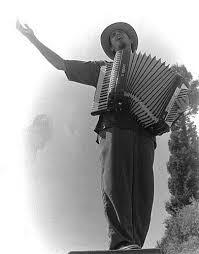 That was Jason Webley’s first experience composing for and performing with an accordion. After college, Jason worked for a small sound company that suddenly went out of business. When his girlfriend left him, he decided to make some changes in his life. He decided that he would travel by bus across the country and busk on street corners and public places with the accordion. He anticipated that it would be over when his money ran out. For two years, Jason managed to support himself as a full time street performer. It was the spring of 1998. He had found his way to the San Francisco Bay Area where he was asked to play at an accordion store in Oakland, CA. That day, he met accordionists, Daniel Ariand and Aaron Seeman. From this chance meeting, the three created an alliance that proved to be the beginning of The Monsters of Accordion Tour, an event that exploded with sold-out performances along the West Coast. Like visionaries often do, Jason Webley captured a devoted following and made a lot of friends along the way. One of the many friendships that Jason formed was with a performance artist and musician from San Francisco, John Rinaldi. A decade before, Rinaldi found a vintage scrapbook at the bottom of a dumpster. The subject of the book was the late Margaret Rucker Armstrong from Everett, WA. Rinaldi was captivated by the beautifully crafted book filled with photos and news clippings from an earlier era and pages of Margaret’s melancholic poetry she had written as a university student. He kept the book for years, sharing it with friends and showing it to anyone he thought might find it interesting. Rinaldi decided to create a show about Margaret, and at the end of the performance, give the contents, in bits and pieces, away to members of the audience. Before he did that, he created a digitized record of her scrapbook. His friend, Jason Webley, later saw those images of Margaret and her work during his 2011 hiatus from nearly thirteen years of touring. Jason became fascinated by Margaret’s scrapbook and already had some familiarity with her family name, having come from the same town in the state of Washington. He assembled a group of writers and artists and they began to write and perform, to tell Margaret Rucker’s story, capture her spirit and acknowledge her life. In December, 2014, Jason Webley released the album entitled, Margaret, and is currently touring to rave reviews. Since Jason Webley first bounded up the steps of a Greyhound bus with his garage sale accordion, he has self produced and released five albums, and owns his own record label, Eleven Records. He continues to tour relentlessly, throughout the U. S. and Canada, Europe, Russia and the Ukraine, and Australia. Of his love for Russia, he says that the invitation from Russia was special because it was the first foreign country to ask him to come and perform for them. He visits and performs often, and has since become somewhat of a celebrity in Moscow. The accordion, Jason says, is “versatile and interesting, you can dance and move, but it’s there with you, you’ve got your grip on it, you’re doing something with your hands and you can accompany yourself, you provide the rhythm and the melody”.